What a convenient way to eat or drink on your couch as well as store your favorite magazines and remote controls! This beautiful white finished accent table has sufficient space for you to place your snacks, drinks and laptop. What a convenient way to eat or drink on your couch as well as store your favorite magazines and remote controls! This beautiful white finished accent table has sufficient space for you to place your snacks, drinks and laptop.
. Its chromed metal base provides sturdy support along with a fashionable touch that will suit any décor. Ample storage for all your needs. ARB Teak products are made from responsibly harvested grade A teak - dried to perfection and beautifully finished. We use only the highest quality hardware made from solid brass and stainless steel, meaning no rust. Traditional in design, the Diana collection takes you back to the Victorian era and blends it with today's advancements. The Diana collection is perfect for the traditional bathroom. Organization meet modern styling with this fashion forward magazine rack. The grey leather look material paired with chrome metal legs give this piece a modern edge that will blend effortlessly with your decor. This rack offers the perfect storage solution for, books, magazines, and electronic devices. Accent Table - White / Chrome Metal With A Magazine Rack What a convenient way to eat or drink on your couch as well as store your favorite magazines and remote controls! This beautiful white finished accent table has sufficient space for you to place your snacks, drinks and laptop. 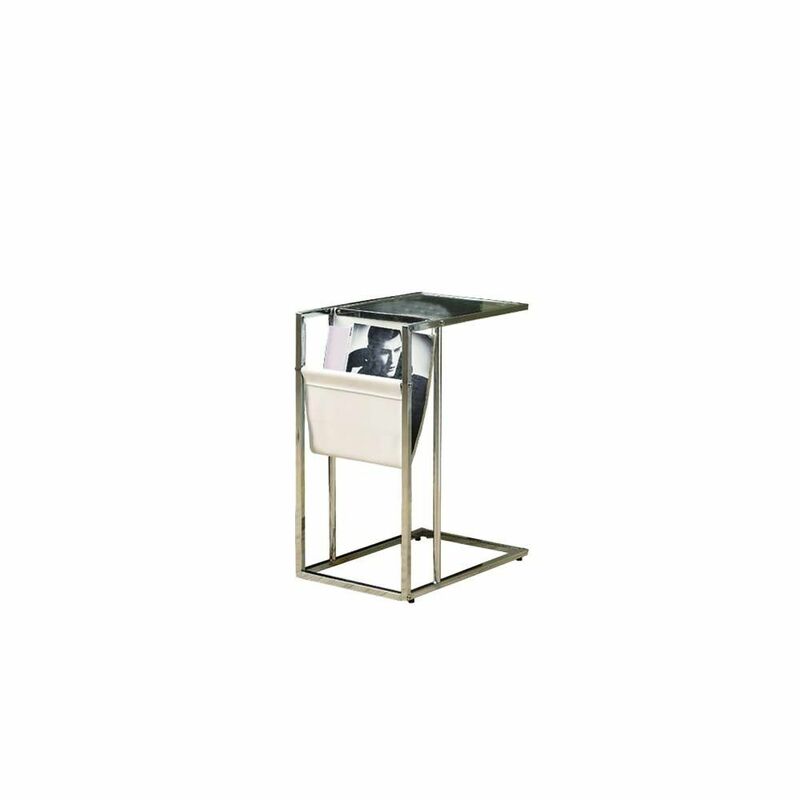 Accent Table - White / Chrome Metal With A Magazine Rack is rated 5.0 out of 5 by 2. Rated 5 out of 5 by purplehaze44 from great end table for a small space This is the 2nd end table I have bought just like this. The 1st was beside a recliner that was in a small space yet needed the magazine hanger on the back.. The most recent purchase was for an end table needed for a small space beside a sofa. The 2nd table we didn't even put the magazine holder on because it was not needed. The best aspect of these tables are they disappear in a room. You hardly notice they are there yet they serve the purpose of having a top to put a drink or remote. We were very pleased with the quality and the ease of putting them together. The most recent table was missing a part, but we just called Monarch, and it was immediately shipped. For the money, these tables are really a bargain. They are contemporary and fit in a small space easily. They are substantial so they don't tip over.